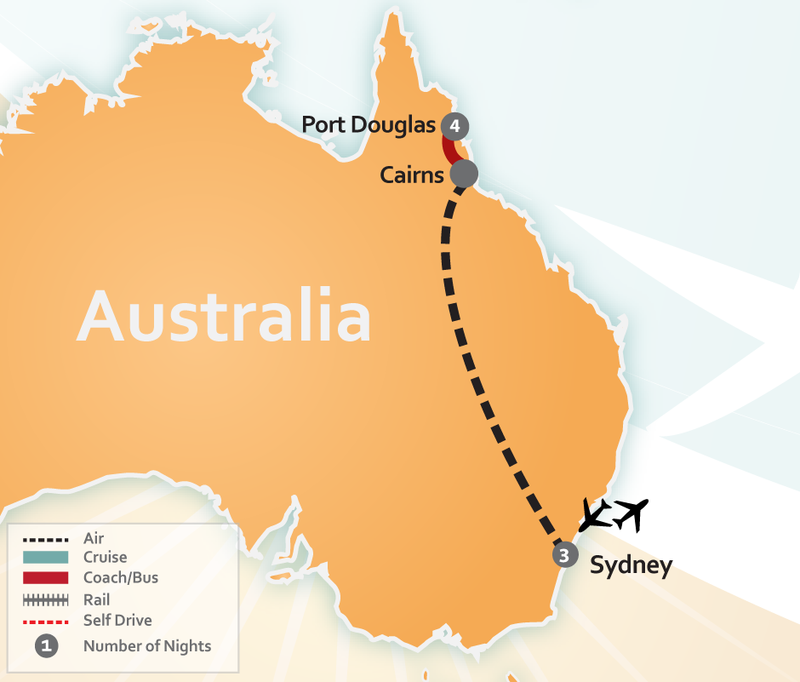 Celebrate your new life together with a once-in-a-lifetime tour of Australia. 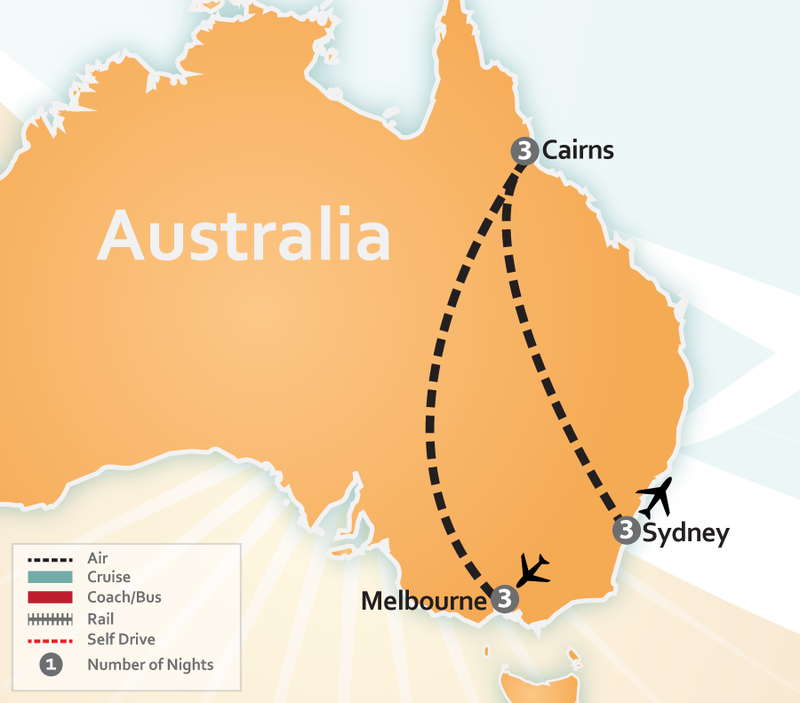 Our Australia Destination Specialists can create the perfect Australia Honeymoon package to suit your needs. Share incredible experiences in one of the world’s top bucket list destinations. Does your idea of romance include picture-perfect beaches with soft golden sands and crystal clear waters? Home to some of the world’s best beaches, Australia’s sun-kissed beaches are the ultimate destination for romance. Head to the Whitsundays for the dreamy white sand swirls and flawless turquoise waters of Whitehaven Beach. With the Great Barrier Reef right at its doorstep, the Whitsundays are perfect for a tropical getaway surrounded in its stunning 74 islands. Take a scenic helicopter ride to Whitehaven Beach and unwind with a relaxing picnic lunch on its incredibly soft sands, or discover the colorful underwater marine life on a snorkeling adventure. For the perfect blend of sunny beaches and metropolitan delights, no city does it better than Sydney. As you explore Sydney’s vibrant harbor, you’ll soon realize why this is considered one of the world’s most gorgeous harbor cities. Bask in the sun with your beloved on the sands of iconic Bondi Beach, snap the perfect photo with the Sydney Opera House behind you and sip on Australian wines at indulgent waterfront restaurants. Wow your partner with a scenic harbor lunch cruise and share the thrill of reaching new heights on an exciting Harbour BridgeClimb. If you like exploring walkable cities by foot, Melbourne is a must. There’s an unmistakably European feel to its central city lanes, vibrant with street art, coffee shops, eateries and bars – a whole hidden world to discover in the heart of Melbourne. Get lost together in Melbourne’s world class museums and art galleries such as the National Gallery of Victoria and the Australian Centre for the Moving Image for film buffs. Revel in the city’s exciting nightlife at rooftop bars or uniquely themed bars in its central lanes. Take a day trip to Phillip Island for incredible wildlife experiences. Here you’ll see hundreds of tiny penguins waddle across the beach on their way back home and spot koalas in the wild. Let the red desert mysticism and ochre landscapes of Australia’s Outback sweep you off your feet at Uluru. Also known as Ayers Rock, this captivating sandstone formation draws travelers from around the world for its magical sunrises and sunsets of brilliant reds and oranges, changing the colors of Uluru into a deep red glow. Ride into the sunset on camel to an indulgent outdoor dinner featuring indigenous bush ingredients and premium Australian wines under the unclouded Milky Way. The perfect touch of otherworldly romance on your Australia honeymoon. No honeymoon in Australia would be complete without a trip to the Great Barrier Reef. Uncover the wonders of colorful coral reefs, dazzling tropical fish, drifting sea turtles and other exotic marine life that call the reef home. Make the tropical hot spot Cairns your base for exploring the reef, where the ocean is your playground and its nightlife will have you celebrating until dawn. 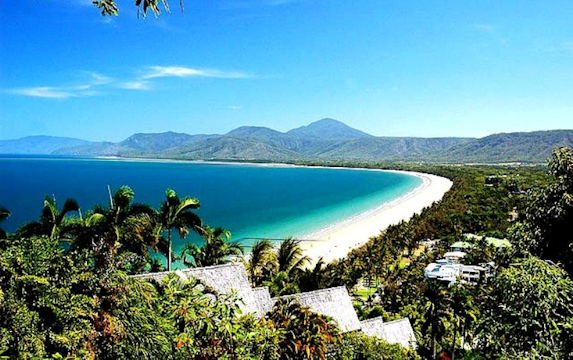 For a more relaxed pace, stay in Port Douglas, the locals’ choice for a beach getaway with a gateway to the Great Barrier Reef. With no building taller than its hundreds of palm trees, you and your loved one will easily surrender to the rhythm of the tropics in Port Douglas. As experts in Australia travel, let us handle all the planning so you don’t have to worry about a single thing on your honeymoon. From romantic hotels to incredible destinations, we take care of all the little details so all you need to do is create amazing memories together to last a lifetime. 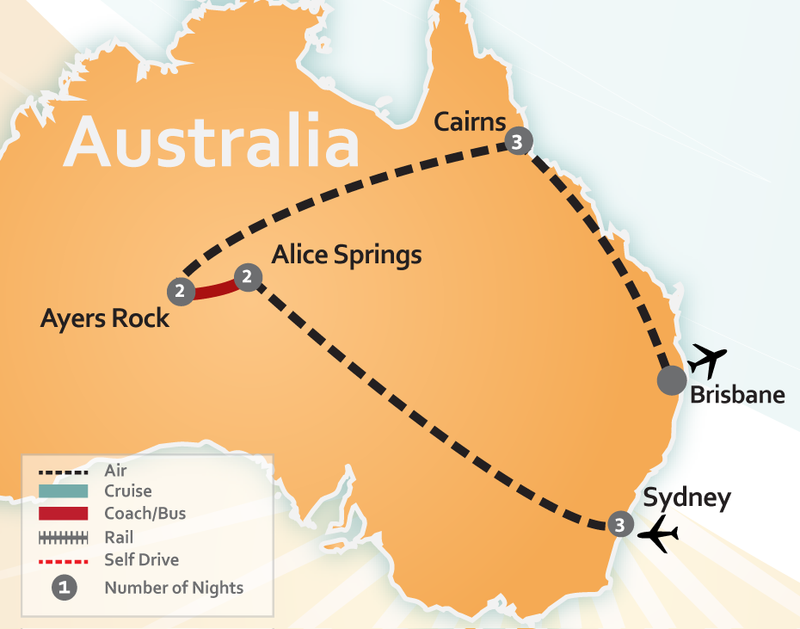 Choose from an itinerary below or request a custom quote to create your perfect honeymoon in Australia. 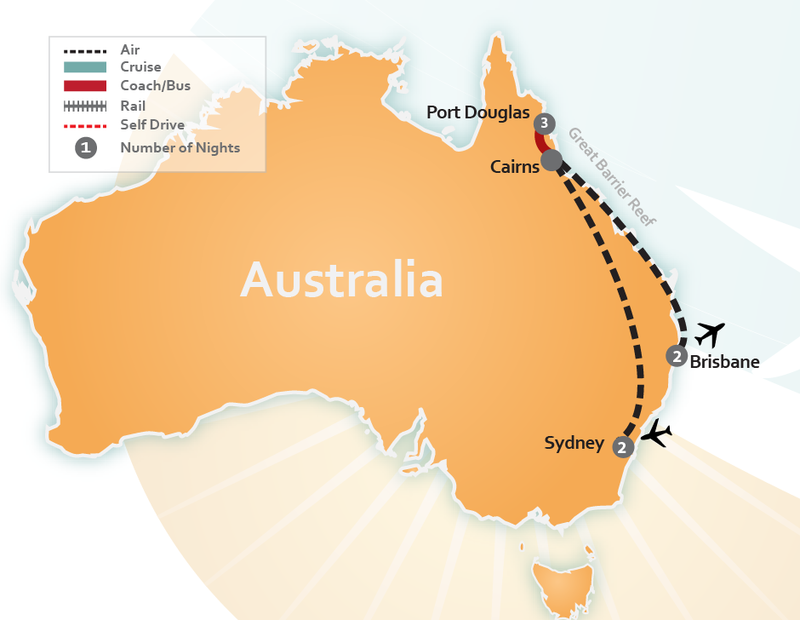 Activities: Beaches, Great Barrier Reef, Local Markets, Native Culture, Rainforests, Waterfalls, Wildlife, Crocodile Hunter’s (Steve Irwin) Australia Zoo, Adventure, Art, General Leisure, Short Walks, Rest & Relaxation, Sydney Harbor Day Cruise, Shopping, Sightseeing, Wine & Dine. Optional activities include: Scuba Diving, Horse Riding, Concerts/Shows, Balloon Ride, Snorkeling & more.